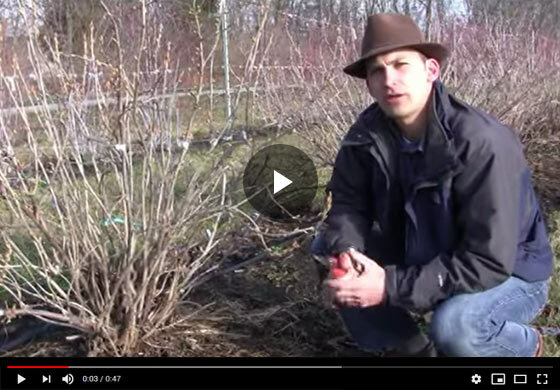 Felix, Gurney's resident horticulture specialist shows how to train currants, sharing insights into the process of proper pruning and care for the plants. Find out the growing conditions that assist fruit development and learn pruning tricks to get the most out of your plants. Hi everyone, Felix here with Gurney's. Today we're talking about currants, and this is the blackcurrant we have here and we've trained this into a fan form, and I wanted to show this to you, so you can think about new places you can plant currants, and this one here is just trained to a couple of wires but you can actually train them onto a chain-link fence or a privacy fence or any vertical structure, over the wall or your house you can even train them too. And the nice thing about it is instead of this being a real sprawling bush which is its general nature, you have this vertical growth that you're spreading out for nice, sunlight to leaf growing conditions. We have a lot of nice fat, fruit buds that are just breaking here early spring. This plant's going to be loaded and we'll shoot another video that'll show you the outcome of this during the fruiting season, so you can see how easy it is to pick and care for this plant. You know we're in the dormancy right now, just barely getting out of the dormant season. It's a good time to be pruning and there's a couple of things here that can be done. This one is really in fairly good shape. We pruned it a lot last year, so really the pruning that's going to take place, it's going to be next season, but there's some stock cuts here we have left where we have a little bit of die back, so we're going to cut that back flush to a new bud. Here's another one. Those flush cuts are much better to have on your plan. We have a little bit of die back here and basically we're looking at stuff that has died back from last year's growth. We don't really need that on the plant. It's a disease harbor. Otherwise, this plant looks very good and it's an interesting way to grow your currants. Another final point with currants is that blackcurrant do very well in shade-full shade conditions, and I have one at home. It's on the north side of my garage. It doesn't get a stitch of full Sun and it produces like crazy and it's a black currant. Not all currants perform that well on sun and full shade, but it's a nice point for getting fruits in those plants. Thanks.